We are announcing June’s new customer promotion! Our signature Japanese cuticle care ensures not only a great look, but healthier nails and longer lasting gel (Shellac gel includes express care only). ※Senior staff requests can be made by paying the $100 difference between senior and regular prices. ※Soft gel removal normally $200 is provided free, hard gel removal normally $400 is offered at $200. Advance reservation required. 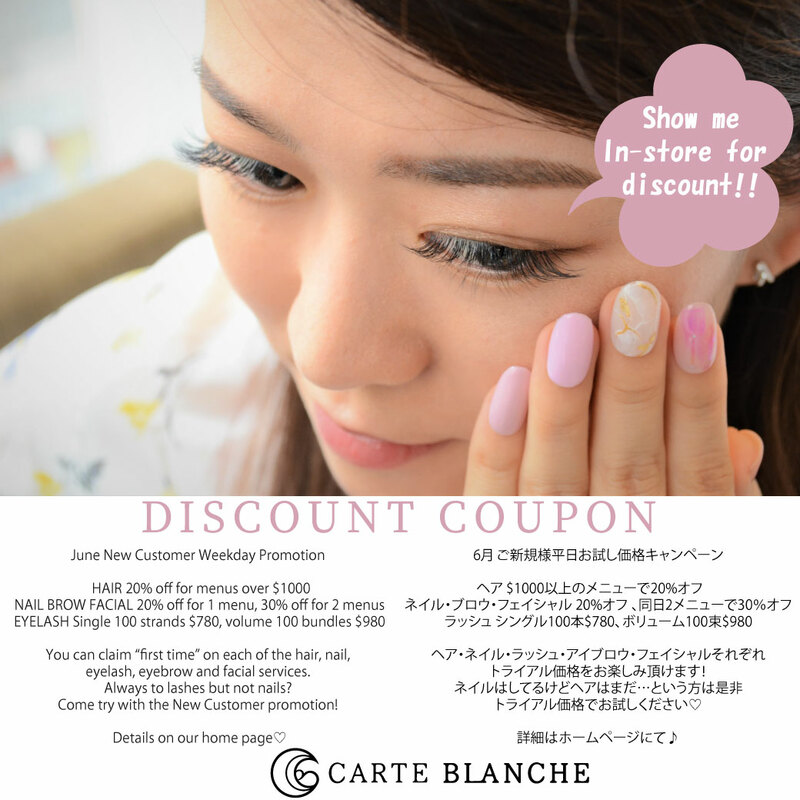 ※If you make a same day new customer booking for hair or lash, this can be counted towards the 2 menus. The nail/brow/facial menu will be charged at a 30% discount, however, the hair and eyelash discounts remain the same. E.g. Hair $1200 + Nail $700 = Hair $960 (new customer 20% discount) + Nail $490 (New customer 2 menu 30% off). ※The strand/bundle number shown is the total for both eyes. ※20 strands/bundles can be added for +$100. ※Other store removal normally $200 is provided free. Advance reservation required. ※As we do not offer technical guarantees for other-store refills, the promotion is limited to new sets. While you are most welcome to make inquiries regarding promotions, and even if you mention the use of coupon at time of booking, you are still required to show the coupon (screenshot on smartphone accepted) in store. ※For weekday visits to June 30. Please note that a change from a weekday to weekend booking will involve and automatic change to regular pricing.